It is a item very elegant and useful. It will be more practical if, when closed you can see the hour, perhaps in a window of the cover . Thank you. The product is Really good. Every one saying they selling Smart cover but no Wake and Sleep but this product have wake and Sleep. Thanks. I strongly Recommend. Good quality, lightweight, doesn't take from the sleekness of the phone itself. Room for one card only.... Perfect for me, may be not for others. Doesn't interfere with camera or volume buttons. Possibly the nicest case I've ever bought for a samsung. Has taken a few knocks and scrapes and you wouldn't know..... excellent quality really. Arrived within the week to Ireland..... No complaints!! Great product and love that the original is still available. Prompt service and reliable. Took much longer than expected to arrive. Great case . Although I had to wait a couple of weeks for a replacement wallet cover it was well worth it. I am delighted with my purchase and I thoroughly recommend your services. Top marks! This is a lovely case but l wish l had bought the one with the led display on the front. A smart colour coded cover. A great cover, not too bulky. I would of liked a pocket inside. This will be my second one. The first one served me well, was still doing its job but was starting to look grubby. Protects the phone well without hindering any of the functions. Highly recommend. The Samsung S7 phone case is just what I wanted. An original and identical one to my Samsung S5 cover which served me well. Slimline attractive sturdy and strong. I have had 3 Samsung phones before this one and I have to say its the best of the lot. Not much more to add. Just keep doing what you are. This offical Samsung galaxy note case is exactly what was advertised, I like its slim line design, room for a card if you want, operating the volume from the case, it's great. Great service, even when I accidentally ordered the wrong phone cover. Took maximum time to arrive but it arrived & I love it. Good quality. Came quicker than projected delivery date. The wallet is designed for the 'phone so unsurprisingly it fits well. It looks good too. The only downside concerns the fact there's only space for one card in the wallet: it would have been handy to have two; one for a debit card and one for a credit card. This cover fits perfectly and does not make the phone feel bulky at all. The cover wakes up the phone when opened and folds right back (360 degrees) making the phone easy to use. Not expensive for the quality. This is a genuine Samsung case and goes perfectly with the s7 edge. Everything fits perfectly and it is nice and slim. I very much like the colour. It works well with the wireless charger and seems to give good protection. This case is practical and stylish, it fits the phone well and is ultra slim. Whilst I like the case and it's style, I must warn customers not to drop it as it does not actually protect the Edge screen which is expensive to replace. I speak from my own costly experience. In Brief the case is perfect as a wallet for the phone and protects the screen from scratches, but does not have impact protection and the screen does easliy crack if the the phone is dropped accidentally. is stylish smart looking product great for business use. This is a genuine Samsung Item .... A great compliment to a great phone. Nice case fits well. Expensive for what it is. I just ordered a flip wallet cover for a Galaxy S7 Edge. I am very pleased with it. It fit perfect. This official Samsung case has been manufactured correctly, so that the phone fits in the case without too much force, therefore it does not scratch the phone. The phone stays put in the case and the texture of the case itself has a quality feel. The curved edge of the case covers the edge of the screen too. It also has a small magnet to activate and deactivate the phone when opening and closing the case. I had broken two screen covers in the four months since buying this phone. I keep it in my front pocket with keys and I needed a better screen protector. The flip wallet works perfectly, providing protection for the screen and sliding in and out of my pocket easily. The item is black and is labeled as an official Samsung product. The price was reasonable and it arrived in about a week. This is the best Samsung proprietary flip wallet-style case for the Edge 7, but is crazy difficult to get. Most retailers stock a similar Samsung case with the clear view panel on the front. This gets covered in greasy fingerprints both inside and out, despite cleaning it many times every day. This case has the same matt finish, neoprene rubber feel finish, but without the clear view panel. It does have a handy sleeve inside perfect for business cards I find. Non-slip, non-marking, & good protection for damn expensive phones. I got this as it is a genuine samsung cover, it is great the way it wakes the phone up when you open it and sends it to sleep when you close it, which will save using the button. Easy to fit and is so snug it's perfect! Ruby colour compliments my black mobile and is easy to distinguish with same phones that we have at work and home.It also feels great to touch. Seems expensive but you are getting something that looks neat and will last! I really love this case and highly recommend it !!! I really love this case and highly recommend it !!! Samsung S7 edge phone is a very expensive phone and I believe this case does full justice to that !! The case is quite strong holding the phone secure even when it falls on the ground. The case looks posh and gold matching the phone so doesn't comprise on the appearance either. Its 100 % worth the money !!! The cover is excellent, very soft and look very neat. My wife loved it as the phone. With this cover phone looks much better and attrac time. Love the case !! Very compact and classy. Holds in the phone very tightly and securely giving peace of mind. Highly recommend this purchase. Its worth it !! Great case for the S7 Edge, protects the screen well and auto locks the screen on closure which my last case failed to do. Not padded as I expected it to be but fits well and does the job it's designed to do. Love the fact it's not just available in black, gold or silver too, adds a classy look to the phone. I'm looking for genuine mobile accessories and unique colour / features. And mobilefun offer variety of accessories. I like it. Mobile Fun Operator told mr what was good & by Jove he was right, Very smart & a good Prtection AGAIN thanks Mobile Fun. I am very satisfied with delivered item. The case align perfectly, and what is more important, the design of the s7 edge stays the same, superb! I would recommend to everyone to buy this case if you want protection, good looking case, real premium item. Recommend! 100% happy with the phone case. delivery was exceptionally quick. no hassles. Great case, exactly as described. I bought one for my husband as well and he loves it too! When I first got this case I really liked it. I don't like bulky cases so this one suited me down to the ground. I liked the feel of it and the fact that it didn't have a clasp on it made it so much easier to go into a pocket. I soon realised however that the nice soft material is ridiculously slippery and the phone has fallen out of my hands countless times. I have never broken a phone before but a week after buying this case, my phone landed on the floor and cracked straight away. Due to not having a clasp, the case opens everytime it is dropped. You can also only fit one card into the card slot as it is very tight. Not only is this case quite pricey, it has also cost me £160 for a new screen. Most definitely would not recommend. -10/10. This is a great case for a Samsung Galaxy S7 Edge. It was for my 17 year old son who is very fussy. So if he likes it it must be okay! He especially likes the feel of it. Maybe that's a bit weird.. This is a beautiful item, compliments the phone perfectly. Nice cover, looks smart and has good functionality. Thanks. 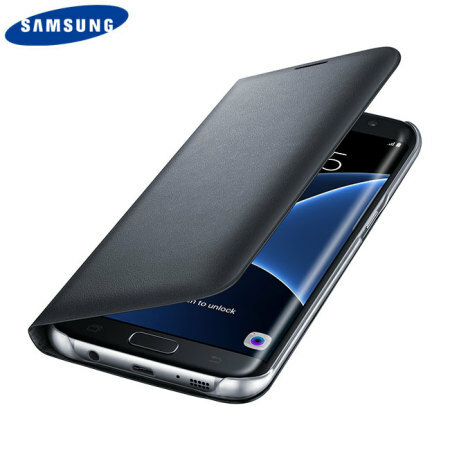 I looked at several websites for a case for my Samsung S7 Edge. After a lot of confusion about which one was best I decided to go back to where I've bought from before. Very competitive on price and delivery very good. I know the case will be of excellent quality as my Sony Z2 case is 2 years old and still good. Vase ordered and turned up 2 days later and was not disappointed. Yet another quality item. Thank-you. I never really want a case, as it just seems to make the design of the phone pointless. That said in the end you normally do. So, does it fit was the only real question i had, and yes it does, very well. It covers the curve, has a nice feel, spot for your debit/credit card of choice and opens/closes your phone. looks as if it will last too, only time will tell on that. Well priced,very good design and takes very little away from the appearance of the phone yet provides good protection and piece of mind about your phone being safe. Quality case, fits perfectly and dosent make the phone bulky. I had to wait a while on the case as was out of stock but worth the wait. Fantastic phone case. Sturdy, looks good. Doesn't take away from the phone. Great feel. The case fits the S7 Edge snugly and I can't imagine the phone accidentally working its way loose. The flip cover protects the screen well and when it is opened the screen wakes up. On the side of the case there is + and - sign, which I imagine is for turning the volume of a call up or down when taking a call with the case closed. A couple of negatives: I have the flip part of the case folded back on itself, so I can see notifications, when on my desk at work. The flip part will now not stay closed when I want the screen covered. This does not really cause me a problem as I can push the phone between other things in my bag which keeps the cover closed. The other slight negative is the case has to be taken off when using the Gear VR as the phone will not fit in otherwise. I usually buy flip covers for the smartphones that I have owned over the years. Some of them have been quite crude although they do the basic job. This is an official cover and I'm happy to say that it's a perfect fit. It scarcely adds any bulk to the phone considering the all-round protection it provides. The material feels very good in your hand (unless you have particularly sweaty palms!). Although described as black it's actually a dark smoke grey and it complements the Gold S7 perfectly, in my opinion! Obviously it's not for people who like to show off their smartphones, and it may be a trifle pricey but in this case (no pun intended! ), you're paying for quality and protection for a (precious) gadget! Great quality item at a fantastic price. I needed a case to protect my S7 edge, as I have never had an edge phone before I was unsure if the cases would protect every aspect of the curved screen. This one certainly does, fitting around each one of the phones curves, protecting every bit of screen, whilst making it very handy to use the phone. The case is very durable, yet lightweight, and any grease marks, dirt marks wipe straight off the surface of the case leaving it looking elegant and new. Complete with a credit card slot this makes it handy to carry a contactless card around for quick payment. I found the best price for this by far on mobile fun and would recommend it to anyone! Great case!, Looks very sleek in design and The Color of the case suits nicely with my S7 Edge (Gold). I really like how it is a bit thinner over the volume buttons because it allows you to change the volume with out opening the case. Quality and durability are good. I would recommend this case for S7 Edge. As usual from mobile fun totally satisfied by the service received. Item came next day fits phone perfect would recommend this company to all my friends.